Question: What do you do if you have more than 6,000 blocks of habitat to survey for wildlife management, but you don’t have anywhere near the number of biologists or field technicians needed to accomplish the task? Answer: If you are a research scientist with the Wisconsin Department of Natural Resources (DNR), you come up with a wild idea. You ask the public if it would be willing to help. You ask if state residents would set up and monitor thousands of trail cameras in areas of suitable habitat across the state. And you’d call it Snapshot Wisconsin. In these days of budget cuts and staffing reductions for state natural resource professionals, it takes creative solutions to fill in the gaps in the gathering of wildlife information, and Snapshot Wisconsin is just such a solution. The program, now in its third year, is growing rapidly and is becoming a key tool in the arsenal of Wisconsin wildlife managers. In short, Snapshot Wisconsin uses a vast network of volunteers to place and monitor trail cameras throughout the state. When the program rolled out in 2016, DNR officials didn’t know how receptive the public would be, but they had seen a similar effort work in the Serengeti in Africa. They suspected that given a chance to help, the public would join the program enthusiastically. They were right. It turns out that Wisconsin sportsmen and sportswomen are a particularly helpful bunch. Hunters and trappers volunteered for the program in droves from the outset. In fact, of the 1,431 volunteers currently tending cameras all over the state, the majority are hunters. Snapshot Wisconsin Research Scientist Susan Frett said, “After they sign up we survey the participants and 60 percent identify themselves as hunters.” That should come as no surprise. Over the years hunters and trappers have given more time, money and physical effort to wildlife management than any other group except for the wildlife biologists themselves. 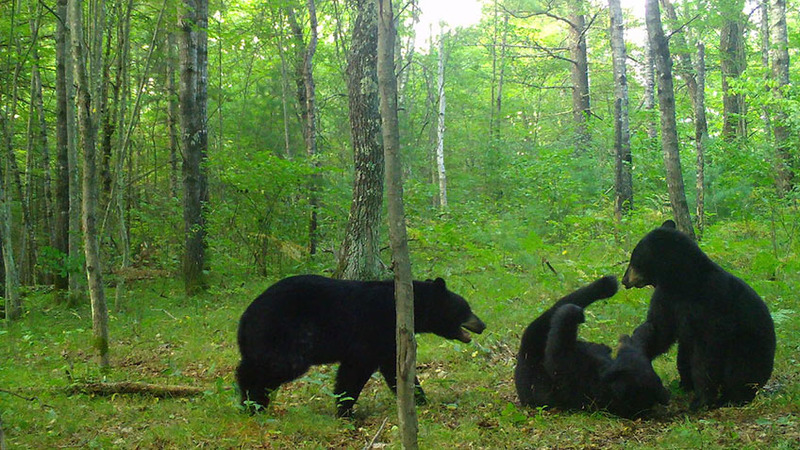 Snapshot Wisconsin captured this image of three black bear cups wrestling. To date, Snapshot Wisconsin volunteers have produced nearly 25 million photos. That number will increase significantly as the program matures and more cameras are added to the network in the next few years. “Phase one of the program ended August 1st,  and we had cameras placed on private tracts of land in 26 counties,” Frett said. With the success of the data gathered in phase one, Snapshot Wisconsin has now entered phase two, which involves expanding into public lands and ideally will provide trail-camera coverage in all 72 counties. Ultimately, Frett and her colleagues hope to have cameras placed in a total of 6,273 research blocks statewide so many more volunteers are still needed. You don’t need to have prior experience with trail cameras to help, and volunteers can come from anywhere. For example, one of the first groups to join Snapshot Wisconsin was a kindergarten class at Woodside Elementary in Sussex, Wisc. Additional educators and other groups and individuals are encouraged to join hunters, trappers and other outdoors people in helping to make this program successful into the future. 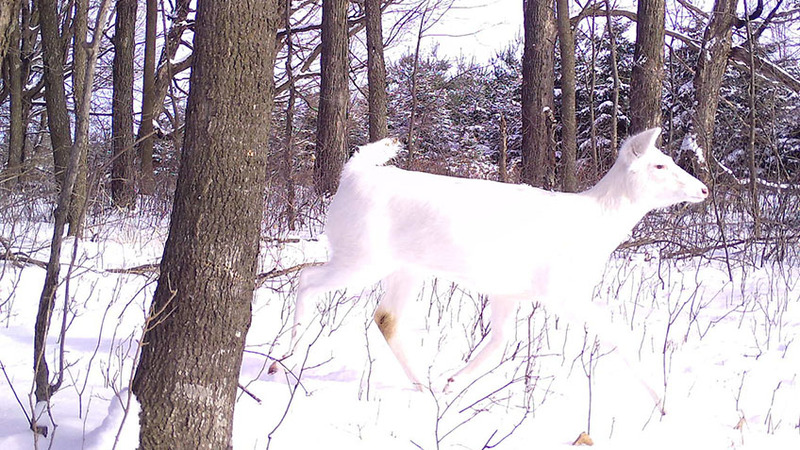 An albino deer was picked up on a trail cam used by the Wisconsin Department of Natural Resources for its Snapshot Wisconsin program. DNR staff members provide the cameras and the training necessary. Volunteers provide the desire to help and a place to put the camera. Access to a 10-acre or greater plot of undeveloped land in a habitat area needing coverage and the ability to upload photos to the Snapshot website are the sole prerequisites to apply to the program. The cameras themselves were created by Bushnell specifically for this project and come preset by the DNR to maintain consistency throughout the project. All the volunteers have to do is place and monitor the camera and upload the photos to the program’s website a few times a year. The information gathered is critical to wildlife managers and is especially important to hunters and trappers since the data obtained through the program will be used to help establish hunting and trapping seasons. A good example of this is the recently completed inaugural elk hunt in northwest Wisconsin. 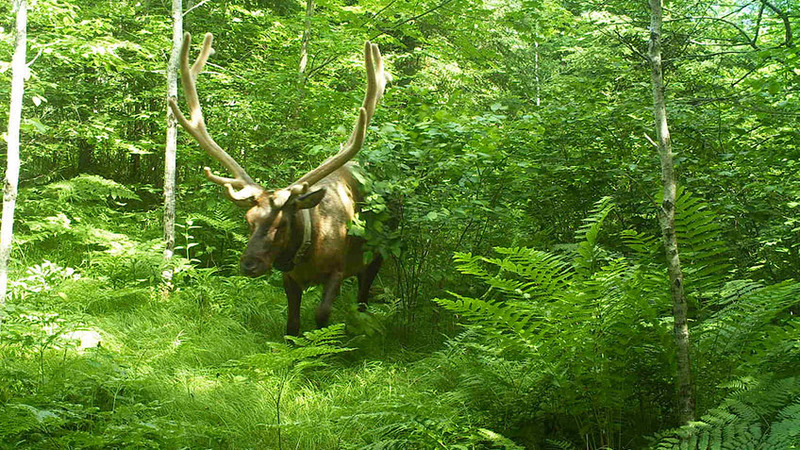 Based on information provided, in part by Snapshot Wisconsin trail cameras in the Clam Lake area, large-mammal biologists were able to determine that the growing elk population, and specifically the cow-to-bull ratio, could support a limited hunt for the first time in the state’s modern history. The majority of data-collecting citizen volunteers for Snapshot Wisconsin are hunters, which is no surprise since hunters are always at the forefront of wildlife conservation efforts. Likewise, some of the very first Snapshot Wisconsin cameras were placed in the south-central part of the state to monitor the deer herd. As I wrote in a story for the NRA Hunter’s Leadership Forum website last year, those cameras are being used to help understand the spread of chronic wasting disease in whitetails in that area. Naturally with that many cameras already in use you’re bound to see some unusual photos. Cameras have recorded things like wrestling bears, albino deer, battling bucks, flying squirrels in flight, grey foxes climbing trees, huge bull elk, species interaction and a host of other interesting critters and behaviors. Even if you cannot physically set up and maintain a camera, you can participate in the program. With millions of photos in the system, classifying and identifying the critters would be another impossible task for DNR staff alone. They need public help with that, too. You can sign up to identify animals in the photographs even if you are not a Wisconsin resident. Interested? Visit Zooniverse to register for Snapshot Wisconsin. About the Author: Keith Crowley is an award-winning writer and photographer and the author of three books on the outdoors: “Gordon MacQuarrie: The Story of an Old Duck Hunter,” (2003), “Wildlife in the Badlands,” (2015) and the newly released “Pheasant Dogs.” When he is not traveling in search of new stories and new images, you can find him at his home on a lake in northwest Wisconsin with his wife, Annette, and a collection of old dogs and old boats.